A Beginner'S Guide To Image Sensors, Formats & Sizes! If you're fairly new to photography, you might often find yourself in the head-scratching situation of trying to follow conversations about image sensors amongst your newly minted photo buddies. Don't worry; you're not alone. Many non-pro photographers have no-to-minimal understanding of image sensors, what they're for, and how they work. After all, most folks who take up photography don't bother as much with the inner workings of a camera as they do with how to work the actual camera. Well, you don't have to be clueless for long. For our latest How-To piece, we're giving you a quick and easy primer on image sensors. We'll talk about what their primary function is in your camera as well as the different types and sizes available. And we'll also touch on how exactly they affect the images your camera--whether the one attached to your smartphone or your full frame beauty--produces. An image sensor gathers the light that passes through your lens, converts it into an electronic signal, and then sends it to the camera's processor to turn into a proper image. Simply put, a camera's image sensor is the device in the heart of your camera that's responsible for capturing light and converting it into an image. There are two types of sensors and several different formats, aka sizes, from the small camera phone sensors that are typically less than 1/2.5 inch in size to the massive medium format ones that are 1.7 in × 1.3 inch or bigger. Generally speaking, the bigger the sensor, the more light it is able to gather, which improves overall performance and image quality. Image processing, lens, and focusing choices also play a roll in overall image quality, but that's a whole other discussion. Still, while talented photographers can create beautiful imagery, larger sensors offer benefits such as higher resolution, much shallower depth of field to isolate your subjects and make them stand out more, better noise handling, and greater dynamic range. With many incredible and powerful cameras being produced today, the difference (if there's any) isn't as noticeable when you're comparing image sensors that around the same size. A 1-inch sensor, for example, won't necessarily outperform a 1/2.3-inch sensor when it comes to image quality. Similarly, many would argue that many full frame cameras can go head to head with medium format cameras, despite the difference in resolution, because of their excellent noise handling and impressive dynamic range. However, in certain conditions, you'll notice the difference between a 1-inch sensor compact or an APS-C camera and a full-frame one. What are the different types of image sensors? Today, there are two main types of image sensors: the Charged Coupled Device or CCD, and the Complementary Metal Oxide Semiconductor or CMOS. They mainly differ in how they handle the light they capture. The older CCD collects electrical charges in photosites, each of which represents a pixel, then transfers them to an amplifier before they're converted to a digital image. The newer CMOS, on the other hand, can manipulate data in each of its photosites individually. They're also manufactured differently so that CCDs are manufactured in a way that allows them to create higher quality images with much lower noise than the CMOS sensors. However, due to improvements in CMOS sensors in the past few years, that gap is closing. Coupled with the fact that they consume much less power and are less expensive, there's little wonder why manufacturers prefer using CMOS in most of their bodies. What are the different image sensor formats? You've probably heard of terms like Micro Four Thirds or APS-C or 35mm Full-Frame. Those are only three of the several image sensor formats available right now, with medium format sensors being the biggest. An image sensor's format simply means its size, and while there are only two main types of image sensors, there are several image sensor formats. Typically, the bigger the camera, the bigger the sensor, which is why camera smartphones and compact cameras usually have much smaller sensors than mirrorless and DSLRs. That isn't necessarily a hard and fast rule. Thanks to new advancements in technology, there are smartphones on the market with surprisingly better, albeit still small, sensors while there are compact cameras with the bigger APS-C sensors. Let's break down digital camera image sensor formats by the types of products in which you find them. Many of today's smartphones are kept thin and compact, though some of them are larger in actual size than compact cameras. For this reason, smartphone camera manufacturers usually go for the smallest sensors. Apple, for example, uses a 12MP sensor that's about 1/2.5 (around 5.76 x 4.29 mm) inch in size for their iPhone X's, as does Google for their Pixel 3 and 3 XL phones. However, Huawei P20 Pro, which boasts Leica-made cameras, boasts a slightly bigger 1/1.7-inch sensor that offers a whopping 40MP. Because of their small bodies, most compact cameras (aka point-and-shoots) have small sensors. The most common sensor size in these cameras is 1/2.3 inch, offering up to 20.2MP. However, there are some that boast 1-inch sensors like the Panasonic Lumix ZS100 and the Sony Cyber-shot DSC-RX100 VI, both of which made it to our Best Point-and-Shoot Cameras list for 2018. Additionally, there are also swanky compacts with the much larger APS-C sensor. Canon's PowerShot G1 X Mark III is a good example. As much as we'd like drones and action cams to have better sensors with much higher resolution, most of them need smaller sensors to keep the size, weight, and cost down without sacrificing the more important features like stabilization, video resolution, and obstacle detection/avoidance. High-end GoPros, for example, have notoriously subpar image quality in lower lighting conditions, thanks to their 12MP 1/2.3-inch sensor. A DJI Mavic 2 Pro, on the other hand, has a 1-inch (13.2 x 8.8 mm) sensor with 20MP resolution, which improves that drones dynamic range and low-light capabilities considerably. Not all drones are limited to 1-inch or smaller sensors. The Mavic 2 Pro's pro-level cousin, Inspire 2, has the much bigger Micro Four Thirds sensor (17.3 x 13 mm), if you've got the funds for a $3,000 pro-level camera. In non-drone cameras, you'll find Micro Four-Thirds image sensor in Olympus and Panasonic systems. This format allows for much smaller camera bodies and lenses, which reduces overall system size, weight, and pricing considerably. The crop factor for M4/3 is 2.0x; meaning, when using a 50mm F/2.8 Micro Four-Thirds lens, it will produce a 35mm field-of-view equivalent to a 100mm F/5.6. Olympus and Panasonic cameras are also generally fast, ultra-rugged, and packed with features. They may not be able to hang in lower lighting, when competing against APS-C and Full-Frame sensors, but both Olympus and Panasonic make outstanding lenses, making their systems more than capable for professional applications. You'll also find M4/3 sensors in video cameras like the Blackmagic Pocket Cinema Camera. Canon, Fujifilm, Nikon, and Sony all make a wide range of DSLR and mirrorless cameras with A-PS-C sized sensors, which gather 15 times more light than 1/2.5" Tye sensors (but 2.4x LESS than Full-Frame). 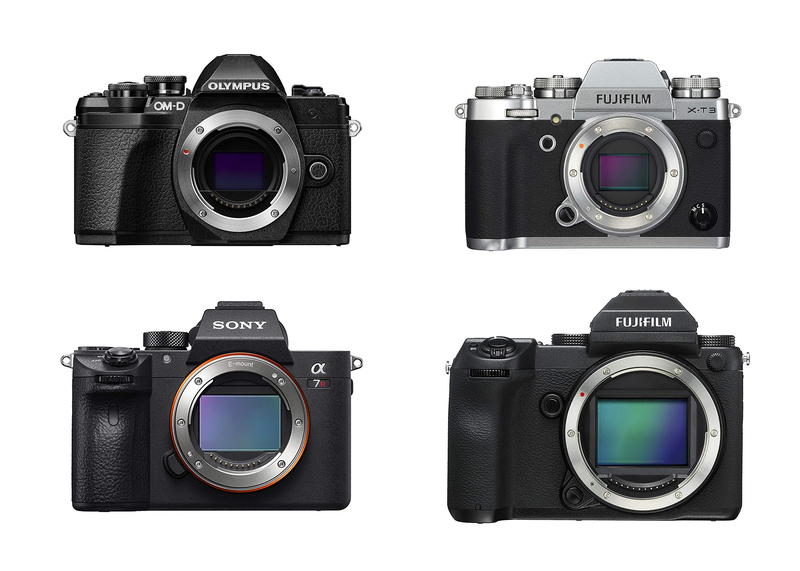 From entry-level to enthusiast to pro-grade, most people with an interchangeable lens camera are shooting with APS-C image sensors. With 1.6x (Canon) and 1.5x (Fuji, Nikon & Sony) crop factors, a 50mm F/2.8 lens look akin to an 80mm F5 on a Full-Frame camera. With high-quality glass and improved processing, APS-C sized cameras can go head-to-head with larger image sensor systems (and they're generally smaller, lighter, and more affordable than full-frame cameras). Fujifilm's APS-C cameras are perhaps some of the best right now, with the new X-T3 leading the charge. It's no surprise that many advanced and pro photographers go for and swear by full frame bodies. Besides offering a bigger field of view, these 35mm sensors also give photographers an edge in terms of resolution, dynamic range, noise handling and ISO performance, and shallower depth of field than the cropped APS-C and M4/3. Plus, since these cameras are aimed at professionals, you'll find a lot of high-end lenses and accessories available in this segment. Nikon, Sony, and Canon currently produce some of the best full frame bodies, with the Nikon D850, Canon EOS 1DX Mark II, and Sony a7R III being the crowd favorites. To digitalize the gorgeous 120 film format, folks came up the medium format sensor. It's so much larger than the 35mm full frame, thus giving medium format cameras the ability to produce superior image quality with a super wide dynamic range and an amazing depth of field. Unfortunately, these cameras tend to be bigger, bulkier, and slower, not to mention more expensive, so that many pro photographers are opting for the less bulky, faster, and cheaper full frames instead. However, for advertising, fashion, and the finest landscape photography, a medium format sensor is the most ideal tool. Although Medium Format cameras are the most expensive to buy, Fujifilm has started releasing some of the most affordable medium format cameras on the market, making this sensor format definitely more accessible to regular consumers.